How many Texans wish they had done more in advance? Superstorm Harvey continues to wreak epic damage to Texas, particularly Houston. But it’s not the wind, it’s the rain. Epic, record-breaking, unbelievable amounts of rain. It’s entirely possible that the entire region will not get back ‘to normal’ for months, if not years. Tens of thousands of homes are flood damaged, many of them total losses. Only one-in-six Houston residences is thought to have flood insurance. FEMA Director Brock Long said 30,000 are in temporary shelters with 450,000 expected to seek assistance. That may well grow if Harvey cycles back for another hit, which is quite likely at this time (see below). The entire city of Houston is deserted except for rescue vehicles. So a major American city is not at work today. Or tomorrow. Or....??? A significant portion of the nation’s energy infrastructure is directly impacted by Harvey’s biblical rains and current total shutdown. Crude oil will accumulate there as refineries are unable to process it into fuel products. The prices for those same fuel products has been rising and will continue to spike higher. If this goes on for long enough, actual shortages will result. The only mitigating factors working against the accumulation of crude at storage farms is the shutdown of wells in the Gulf as well as possibly a few wells in Texas' Eagle Ford region, for which no back-up power exists at the well sites. I don’t have any information on how extensive that might be yet. I'm just guessing at this point. Rivers in Houston are not expected to crest until Tuesday, at some 11 feet (!!) 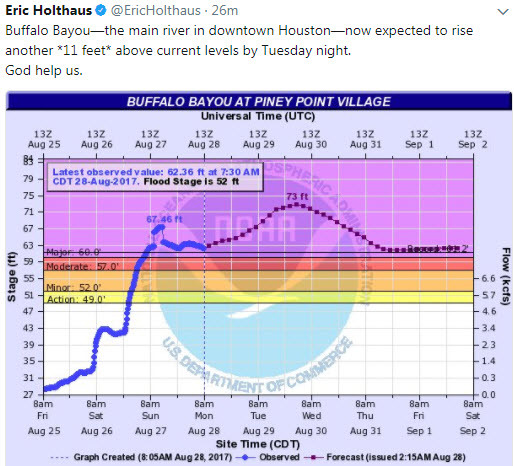 higher than their current “major flood” stage (forecast as of 2:15 a.m. August 28th, 2017). There’s no historical parallel for this level of flooding, so we’ll just have to wait and see how this all plays out. The good news is that the past 24 hours have seen relatively little rainfall (just under an inch). That would be thoroughly cruel to those who's lives have already been upended by this storm. But nature can be rather remorseless that way. HOUSTON—Tropical Storm Harvey was poised to re-enter the Gulf of Mexico Monday and make another landfall closer to Houston roughly two days later, prolonging the slow-motion flooding disaster that already has crippled one of the nation’s largest metropolitan areas. The storm, still over coastal Texas, is not expected to regain hurricane strength as its eye moves back over water, according to the National Hurricane Center. But its plodding, easterly track means as much as 20 more inches of rain could fall on the Houston area. The region has seen as much as 30 inches in recent days, turning roads into rivers, inundating homes and requiring rescues for thousands of stranded people. 20 more inches might fall. This is really without any precedent. It’s a very serious situation and people are mostly shocked and unable to process the enormity of this at the moment. The last part in bold above is really concerning. The reservoirs in the region are all completely full, or in never-before-seen record territory. If you live downstream from one of these you really ought to consider evacuation. That’s a brand new record high for the reservoir. Here’s some info on it. The Addicks Reservoir and Addicks Dam in conjunction with the Barker Reservoir prevent downstream flooding of Buffalo Bayou in the City of Houston. From 2008-2014, the U.S. Army Corps of Engineers Galveston District implemented $4.4 million in interim risk reduction measures (at Addicks and Barker dams) to address deficiencies until long-term solutions could be identified and executed. In 2014, staff completed a Dam Safety Modification Study to evaluate long-term repairs and address issues associated with the dams. Staff presented this information during a public meeting Oct. 29 at Bear Creek Community Center in Houston to discuss these plans and gather feedback. Construction is scheduled to begin May 2015 with an estimated completion date of 2019. It’s too bad that the dam remediation efforts were still 2 years away from completion as that dam is now being severely tested. All people the Buffalo Bayou area are strongly advised to consider evacuation. “Controlled” releases are already underway and people have been asked to voluntarily evacuate. The Harris County Flood Control District announced on Sunday night that they will have to open the Addicks and Barker reservoirs to relievesome of the pressure on Monday morning. Because of these releases, voluntary evacuations are being issued for people who live near the two reservoirs. It remains to be seen if the releases can keep up with the rainfall. I don’t have any good information on that at present, but will keep researching. Evacuating is a really big deal and not to be undertaken lightly. The main reason is that you aren't evacuating alone, but along with hundreds of thousands if not millions of other people. I lived through several storms on the Gulf through the years and I can shed a bit of light on the topic. For one thing, evacuating is expensive. Factor in the weeks without work. Yes, weeks. Because even if you do manage to make it out of the path of the storm (which isn't a guarantee unless you travel hundreds of miles), there's no promise you'll be able to return home in a timely manner. Roads wash out, gas stations run out of gas and lose power, entire towns shut down. The actual act of transporting yourself somewhere else is a challenge. Cars sit bumper to bumper, filling every highway and every lane. You've got to leave early enough to actually make progress, or else you'll be caught in the road when the storm hits. I was in Johnson Bayou days before Hurricane Gustav hit. I was driving from an EMT outpost to the corner store, a drive which normally took 20 minutes. It took me 8 hours, all because of evacuee traffic. If you do decide to leave, there's no guarantee you'll still have a job to return to. Then there's the sudden cost of a hotel room for weeks on end. Everywhere that's out of the direct path of the storm is full, I mean packed to the utter brim, no more rooms in Bethlehem and no more mangers either. Everyone ELSE who's decided to evacuate is headed to the same spots, and these aren't luxurious destination locals. You go just far enough to get away, which sometimes puts you and your family in the middle of some podunk town that's totally not equipped to handle a massive influx of people. So if you do find a room, which is tough, it's expensive. If you go the shelter route, and you evacuate to a designated area, well buckle up. You're in for a few weeks of sharing cramped quarters with lord knows how many folks, all while you're unlikely to have access to things like showers or washing machines. Then there's the drive itself. Timing an evacuation isn't just expensive, it's really tricky. Yes, for days and days we track the storm as it builds in the Atlantic and closes in on the shore. The people down south are probably more savvy at it than you realize, and for good reason! Their lives could depend on it every single summer. But these storms are incredibly hard to predict with extreme accuracy. The margin of land area that these storms could hit in storm projections is laughably huge at first. Then, as the week closes and the storm draws nearer, the land mass gradually narrows as possible outcomes are ruled out. The last 4 days are where its most critical. You spend those days glued to your TV screen and your radio. Every waking minute you are on red alert, thinking about and prepping for this storm. You have this small window of time in which you have to weigh the massive costs and stresses of evacuating against the actual level of threat posed to your life. Actually getting on the road, if you do decide to evacuate, is STILL not a guarantee that you'll be out of danger. Once these storms make land fall, the amount of moisture they drop can cause severe flooding all the way up to Canada in the most extreme cases. So what if you run away, only to get caught in disaster somewhere else? And then there's the tragic cases -- elderly folks too old to go through the arduous process if paving and leaving their homes in the face of a storm, and without a living relative to help them do it, or people who live hand to mouth, pay check to pay check, with not enough money to leave. It's incredibly risky to stay, and incredibly difficult to run. And sometimes these storms come one year after another, so that if you end up evacuating one summer, you might not be in a position to do it the next, either because of finances or putting your job on the line. And then there's the ever-present worry that you're going through all this hassle for no reason; for a storm that'll just fizzle out in the Gulf and veer off to hit somewhere else at the last second, which makes you less inclined to listen to the next warning, and the next. The former Hurricane Harvey continues to trigger power outages across Texas. As of 7:25 a.m. CDT on Monday, August 28, there are more than 302,000 electricity outages across Texas, according to the Data Fusion Solutions power outage tracker map. That’s down by about 14,000 since Sunday, August 27. So a bit over 300,000 structures are without power. How many people are directly affected by that is probably close to a million, assuming 3-4 people per structure. Now, lets talk about the dangers of having power in a flooded house. These people are taking their lives into their own hands here. ANY electrical that's been exposed to water, especially breaker boxes is considered damaged beyond repair and MUST be replaced. Why? Corrosion. All these contacts, especially with active voltage and current in the lines, are corroding as we speak. ALL wiring and components will have to be replaced, it is part of the restoration process to get your power restored to the house. Now imagine possibly tens of thousands of homes that all need to have their wiring replaced before the lights can go back on and you have a sense of the scale of the problem. It’s huge. Next, we'll talk about what's happening to the grid in these areas. Power comes to your house via a substation, any of these substations that went underwater, whether these cables were buried or not, will have to most likely be ripped out and be replaced. Oy. It could be a very, very long time before some areas and certain customers will see any power restored. So the power outage factor is going to make Houston a very unlivable place for any and all affected customers for weeks to months to possibly years depending on circumstances. Given that Houston is basically a hot, humid swamp with a mosquito problem most people will rightly conclude that it’s just not livable without power for any length of time. 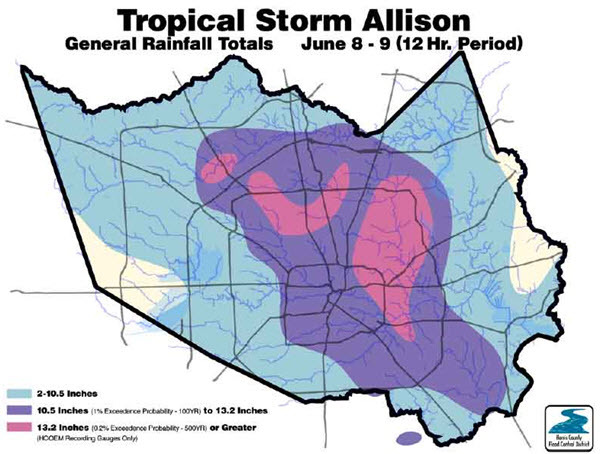 The worst storm on record for the area was tropical storm Alison in June of 2001. It was calculated at the time to be a 1-in-500 year event. Well, that lasted 16 years and 2 months before being shattered. Note that the purple and pick areas represent rainfall totals of over 10 (purple) and 13 (pink) inches. Now, for comparison, here’s the Harvey totals through Sunday. I have helpfully circled in red the areas that had more than ten inches of rain. It’s practically the entire region! There are a huge number of dots on the Harvey chart that are already over 15” and even 20”. That means that Alison, 1-in-500 year event that it was, is not even remotely comparable to Harvey. Because Alison caused $9 billion in damage, we’re going to have to scale that up by some factor…let’s start with 10x? And that’s just to date. If Harvey cycles back out-and-around who knows just how much more serious this could all get? At any rate, now that 1-in-500 year events are happening far more frequently than that, we now have to consider that past weather history is not a useful guide for us anymore. Beyond the Category 4 130 mile-an-hour winds, the devastating eye wall, and the storm surge hundreds of miles wide, the most destructive part of Hurricane Harvey as it bears down on the Texan Gulf Coast might be the rain. But this time, even that may not be true. Although Texas and Louisiana—owing to the constant threat of floods—are among some of the places in the United States where flood insurance is most prevalent, there are few places where even a quarter of all homes are covered. 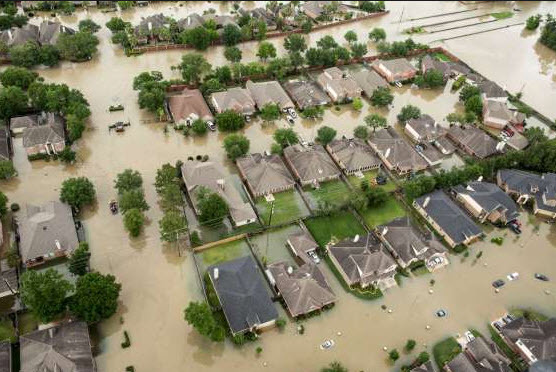 In Houston,just over 119,000 places are covered by flood insurance policies backed by the National Flood Insurance Program, which helps fund most flood insurance policies. There are just over 800,000 occupied housing units in the city, which means that somewhere under a sixth of all homes in the city have flood insurance. The situation is the same in Corpus Christi, where 19,183 buildings are insured of around 115,000 occupied housing units. The dearth of flood insurance policies makes the result obvious: Most people who lose homes or have them damaged in Harvey won’t have money to replace or repair them. Merely one out of six homes being insured is a huge predicament. Said the other way, 5-out-of-6 homes *not* being insured means that a huge number of people will simply abandon their homes and wander away, never to return, exactly as happened after Katrina. The economic impact to Houston is going to be severe. Few can appreciate just how serious at present. Energy is a finely-tuned and sensitive business, especially the oil business. Keeping a narrow balance between oil and gasoline and diesel stockpiles is an art form. Slight disturbances in either oil (the feedstock) or the products (gasoline and diesel) can really impact the prices for both. Harvey knocked almost 15% of U.S. refinery capacity out of commission, which threatens to boost fuel prices across the country. Energy markets could be in for a bumpy ride when they open Monday as investors try to gauge the impact of the disruption. After slamming into Texas on Friday and causing massive flooding in Houston over the weekend, the storm was moving east on Sunday toward a refining hub near the Louisiana border. That could shut down even more of the U.S. energy infrastructure. As always, preparing before a disaster is cheap and honorable. Afterwards it’s expensive (if not impossible) and irresponsible if it becomes a “me vs. them” hoarding operation. It's a little eerie how quickly our advice from just last week, Better A Year Early Than A Day Too Late, has been validated by Harvey. The basic preparations that Adam and I outlined in our book Prosper! would have served anyone and everyone well in the affected areas had they followed them before Harvey hit. Certainly, there might be some losses of carefully-manicured gardens and such because, hey flooding, but all the rest would have been net positives. Being in shape, having stored food, back-up energy sources like solar, rechargeable batteries, and generators, and a supportive community network would each proved to be useful and -- in combination -- invaluable. Like with Hurricane Sandy, there will be an enormous number of people interested in preparing for a couple of weeks after this disaster passes. Then the decay function will hit, and barely 2% to 3% will actually take any real concrete steps on their own behalf once the lights come back on. I’m looking forward to hearing from our affected members. The good the bad and the ugly. What worked, and what didn’t? This was a relatively hastily-compiled report; such is the nature of fast-moving events. I will be providing additional data, insights and comments in the comment areas below as we work to keep up with developments. Harvey has dealt a serious blow to the Houston area and, by extension, the entire US. And the situation is still developing, meaning it could get a lot worse before it gets better if Harvey comes back around for another swipe. The US, as well as the world, really has to begin to grapple with the idea that “once in 500 year” events are actually more like “once in a decade” events now. How we can really plan and prepare for these events is an enormously tricky task. In many cases the answer is “you can’t.” For example, even if you were a star member of the Peak Prosperity preparers club, if your house is standing in 20 feet of water, you’re SOL like everyone else. The only proper response to being in flood zones during this era of far-more-frequent mega storms is to not live there. It’s really that blunt, sorry to say. These are really hard to even wrap my mind around. And this next one is a GIF, so if you click on it you will get to see the action of this water pouring into a basement near the TX medical facility. Roughly 2.2 million b/d of refining capacity has been shut. Houston-area refineries began shutting Sunday because of flooding. Refiners have not reported any damage so far. ExxonMobil was shuttin its massive Baytown, Texas, refining and chemical complex due to flooding caused by Harvey, the company said Sunday. Baytown, at 560,500 b/d, is the second-largest refinery in the US. Shell was shutting its 340,000 b/d refinery complex in Deer Park, Texas, due to flooding, the company said Sunday in a message on a community hotline. Phillips 66 began shutting its 247,000 b/d refinery in Sweeny, Texas, due to fears of Harvey-related flooding in Brazoria County, the company said Sunday. The Texas Gulf Coast is home to 4.944 million b/d of refining capacity, while the Louisiana Gulf Coast is home to 3.696 million b/d of capacity, according to the US Energy Information Administration. ...and this image has the updated storm tack on it. Very handy. Too many Texans hyper focussed on being overrun by Mexicans instead of water?? Best picture of Houston so far? Of course, with so much heavy industry and chemical plants and refineries, the flood waters of Houston are going to be toxic. But there’s something being reported in the air too indicating that perhaps tanks have been breached or pipelines have ruptured. Parras said there are chemical smells in the air all over the East End, but particularly in directly communities adjacent to Houston’s sweeping petrochemical industry. And residents can’t escape the smell, because flood waters have overtaken the city, and could reach over four feet in some spots. “Fenceline communities can’t leave or evacuate so they are literally getting gassed by these chemicals,” Parras said. It’s still unclear exactly where the smells are coming from, but Parras suspects the source is the many oil refineries, chemical plants, and gas facilities nearby. Several of these plants have shut down or are in the process of shutting down due to Harvey’s historic flooding, and shutdowns are a major cause of “abnormal” emission events, according to a 2012 report from the Environmental Integrity Project. Short-term impacts of these events can be “substantial,” because “upsets or sudden shutdowns can release large plumes of sulfur dioxide or toxic chemicals in just a few hours, exposing downwind communities to peak levels of pollution that are much more likely to trigger asthma attacks and other respiratory systems.” The communities closest to these sites in Houston are disproportionately low-income and minority. These sorts of reports are troubling in the immediate term for the residents. They also indicate some amount of damage to the plants themselves as these chemicals are not usually released so something, somewhere probably broke. Gasoline prices are likely to spike from here...that's one interpretation of these reports. I mean, nationally, not more than they already have, locally, in Texas. Lots of rain still to come. Here's the latest from the Weather Channel (it's 5:00 pm Monday, 8/28). I actually visited a refinery once. I'm not sure if it was one of the workers there, or my friend (a chemical engineer for Chevron), but I was told that once they build a refinery at a site, they can never permanently shut it down because if they did, it would become one of those EPA superfund sites immediately because of all the toxic crap that has spilled at the site over the years. Not sure if that was just hyperbole, but presumably if you were to soak the site in 4 feet of water, the run-off presumably would be not so great for health. On Democracy Now, it was said today that in the past some industries have used these types of flooding events to release stocks of chemicals while nobody is looking, avoiding this way the cost of disposal. Chris, thanks for helping us understand some of the "invisible" but enormous consequences of all this flooding we're seeing in Houston. -Like the need to replace all the wiring and electrical components in all the homes where it has gotten wet from the flooding, before their electricity can be restored. And the fact that only 1 out of 6 homes has flood insurance (so chances are at least 5 of 6 places aren't getting restored). It's very sobering. It really brings home just how devastating an impact Harvey has had on Houston. ... and with good reason too, IMO. Which article are you referring to?Not the Bryan Parras interview? Thank you, Chris. I always appreciate your observations on current events. A lot of the media coverage that I've seen (in online versions of print newspapers, that is; I don't watch television news) has shown everyday people helping their neighbors in a time of great suffering. That's been a bit of a surprise to me, not because it happens, but because such everyday decency rarely makes headlines. AMY GOODMAN: David, just before we go, I hate to interrupt, but i wanted to ask you about this. Hurricane Harvey’s arrival came as Bloomberg News reported that the FEMAdirector, Brock Long, who just held a news conference, on Friday was pushing for an overhaul of disaster relief so that states, cities, and homeowners bear more of the cost. And I also wanted to ask you, very briefly, to explain how the petrochemical industry has exploited past natural disasters to its benefit. For example, releasing toxic chemicals that are otherwise too expensive to get rid of. DAVID HELVARG: Yeah, unfortunately, there is a history—during storms and other disasters when people aren’t watching, industry has released hazardous waste into the floodwaters, essentially, to save money. This is just like offshore the shipping industry will release oily waste into the ocean to save money. And so you have to have really close monitoring at times like this. Luckily, right now, the Coast Guard, along with having its SAR—search and rescue helicopters—in the air and Swift Boat rescue teams on the water, I am sure they also have the strike team out of Mobile, Alabama, that’s looking at the pollution. As we said earlier, the Houston Ship Channel is part of Cancer Alley. It is a huge complex of petrochemical facilities. And it is bizarre that they had a voluntary shutdown. That should have been mandated. And there is a good chance that either accidentally or intentionally, you’re going to see a large-scale pollution release, because of where this is located. You’re certainly going to see a claim of disruption of production, and they’re going to jack up gasoline prices. That is just what they do. AMY GOODMAN: Well, David Helvarg, we want to thank you for being with us. Executive director of Blue Frontier, an ocean conservation organization. He is speaking to us from San Diego, California. When we come back, we’re going to talk to people in Texas about what happens to undocumented immigrants in times like this. This is Democracy Now!. We’ll be back in a minute. We live south of Corpus Christi and Harvey just missed our area. We began the usual fire drill of preparing for the hurricane, but it veered north just in time. Bizarrely the follow on weather was delightful - sunny, crisp, and breezy - while the rest of the gulf coast became an apocalyptic nightmare. As I watched the news I was painfully aware of how close we came to being flooded, displaced, and disrupted. 1. Be prepared to accept refugees. Family members are on the way (I think). At this point they are without resources and fractured. Dad is a cop and cannot leave Houston. We are happy to accept them into our home - but it wasn't exactly planned. In a wider emergency the same might happen and I will say yes then too. I need to expand my preparations for the likelihood of more people camping out with us. Turning everyone away outside of a pandemic scenario is not an option (really). What's the point of all this anyway if you can't help people? 2. Being 5% prepared is WAY better than zero. As I watch people in Houston it has occurred to me that I need a boat. I live on a body of water which has flooded before and will flood again. I built my home well above the flood plain - but Harvey just made a joke out of that math. As I watch people wade in chest deep water while others float by in boats; I'm buying a boat. Today. 3. Being prepared is great! I needed to do NOTHING to get ready for the hurricane at my home. Turns out that was really helpful because my time was spent getting other people and places prepared. All of my employees (save one) asked for the day off (to get their homes ready) leaving me alone in my preparations. Thankfully I didn't have to waste time at the gas pump, ATM, or the grocery store. 4. Evacuation plans are a real priority for me now. With four kids my mental default position has been to "hunker down". "We don't evacuate for hurricanes here" has been the attitude because we are prepared and have always done well. Harvey has demonstrated this is NOT ALWAYS POSSIBLE. I will now focus my considerable prepping energy to developing a viable evacuation strategy. Not an overland hike in ghilli suits - but a real strategy to get this group of people somewhere else quickly and safely. Routes in every direction. A list of destinations. Checklists for packing, securing, and evacuating. Documentation, asset relocation, etc. I am even going to develop a plan to go into Mexico. I had a day and a half between threat presentation and expected landfall. Some events may present even less time. 5. I need to be able to execute a plan at less than 100%. As luck would have it, I pulled a muscle at CrossFit a week before and would have needed to do all the above while limping around in pain. I represent the lion's share of muscle power for the family - but can they execute in my absence or incapacity? Hmm. . . not ready for that. 6. It is possible for two bad things to happen at the same time. The financial crisis could begin, North Korea could strike, or any of the other crap I worry about could commence at any moment. WHILE LIVING IN A FEMA SHELTER because I hadn't planned on evacuating. Am I ready to execute trades, etc. while in that shape? Hmm. . . not ready for that either. I am thankful that we were spared the apocalypse but it has (again) identified holes in my plan that are the result of false premises. Challenge yours because you just can't make this stuff up. I am requoting your entire, thought-provoking, honest, and detailed comment below because it's just that good. You've exemplified the true value of this site - intelligent and curious people coming together to courageously face what is and what's to come. So we prepare, and then note where we are still falling short. We do this because we have the responsibility to others who are not gifted with either/both the capacity or the resources to face an uncertain future. We do this because we are prudent and because we care. One of the dams around Houston has begun to overspill. If I understood Scott Cahill's various posts correctly, the worst is still yet to come as water falling now won't hit the reservoir for another day or two. Rector, excellent post! It's a great reminder that no matter the preparations we make, we can't possibly cover everything, yet having zero preparation means you can't cover anything that happens, so some is better than none. We at Chateau Snydeman need to keep that in mind, because no matter what we do, we constantly feel like we're not doing as much as others are, or we need to be doing. Such is prepping. Addicks Overspills and this is a dangerous new development. While the overspilling was expected, the pace of recent water rises indicates that the situation could get worse, possibly leading to a breach of the aged, earthen dam. 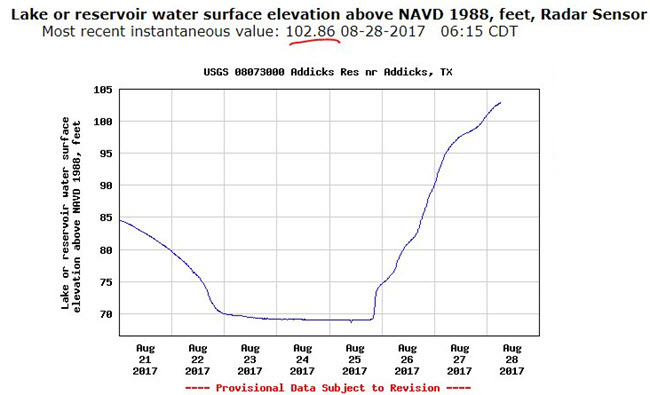 Aug 29, 2017 9:28 a.m.
A major dam outside Houston has begun spilling over as Storm Harvey pushes the reservoir past capacity, a Texas official says. Engineers have tried to prevent nearby communities from being inundated by releasing some of the water held by the Addicks dam. But flood control official Jeff Lindner says water levels are now over the height of the reservoir edge. Harvey has brought huge floods to Texas and is starting to affect Louisiana. Unprecedented rainfall has forced thousands of people to flee their homes. At least nine people are reported to have died in the Houston area. While spillover would not cause the Addicks dam to fail, it would add more water to the Buffalo Bayou, the main river into the fourth largest city in the US. This is major news. Addicks dam is one of the six worst dams in America. Overspilling most definitely could lead to dam failure, despite the very odd assertion made in that last sentence. “While spillover would not cause the Addicks dam to fail…” Really? Who said that? Is this the opinion of the BBC reporter or an expert that they forgot to quote or cite? This is a very strange and strong assertion to make. For a more nuanced view, let’s turn to a different source. The two earthen dams were built some 70 years ago in a then-rural part of Harris and Fort Bend Counties that has since seen explosive growth, allowing water to flow more freely over the paved landscape. The dams are now midway through a three-year, $75-million repair and restoration project. Because the reservoirs are typically empty or mostly empty, the dams have experienced a sequence of increasingly frequent on-and-off stresses due to increased development and more-extreme rainfall events in the Houston area. In 2009, the USACE rated the Addicks and Barker dams as being at “extremely high risk of catastrophic failure,” which put them among just six dams in the nation with that designation. It’s important to note that Addicks and Barker have not been considered at imminent risk of failure, according to USACE, who say the designation hinges in large part on the scope of the disaster if failure were to actually occur. As reported in the Houston Chronicle last year, “If the dams failed, half of Houston would be underwater. Under the worst scenario at Addicks, property damages could reach $22.7 billion and 6,928 people could die.” The Houston Press, which published a harrowing in-depth report on the state of the dams in 2012, filed an update on Sunday. So this is definitely a serious situation. Perhaps the dam is safe, perhaps not. But being in bad shape to begin with and facing an absolutely unprecedented strain does not give anyone much cause for comfort here…. If you live downslope from these dams, get out now. Overspilling most definitely could lead to dam failure, despite the very odd assertion made in that last sentence. Yeah, I noticed that too. So desperately do we modern humans cling to normalcy at the expense of reasonable skepticism and preparation! I can't tell you how many people on my Facebook feed are literally coming out and denying that these storms represent any kind of sign of climate change. How many once-in-a-century storms hitting inside a single decade does it take for people to finally start putting the puzzle pieces together? The Brazos levee at Columbia Lakes has been breached. Good luck to the residents there. That's a bad situation. Perversely, and disgustingly, the central banks are busy manipulating the US stock indexes upwards at the moment. I know they think they are helping to provide a calming lift to a beleaguered nation, but the optics of having equities cheer on the destruction is truly galling to this observer. Tone deaf beyond any reason. After reading Rector's excellent post, I am wondering anew about the value of a bug-out shelter on much higher ground some distance away, or in the case of those of us in Earthquake Country, far enough away from fault zones to be unaffected by a quake. I have questioned the notion of bug-out shelters in rural locales being options for permanent relocation, and wrote a 2-parter here on the trade-offs involved in having a true second home (i.e. equipped for long-term occupancy) elsewhere. Even a simple shelter (trailer, small cabin, etc.) would be extremely valuable if the alternative was a public shelter or crashing at a relatives--OK for a few days, but problematic for a stay of weeks unless the relatives' property is expansive. Anyone with a bug-out shelter a day's drive (or less) away could get there and if the storm passed without any major disruption, return home in a day. But if they needed to stay for weeks or even months, the bug-out shelter would be a welcome option. I am also pondering the immense value of having 1.5 day warning that a hurricane will make landfall. Earthquakes tend to provide some early signaling but it is generally ambiguous. Those of us in EQ Country will be making assessments after the damage has already occurred. If the roads remain open, a bug-out shelter would still be extremely valuable, especially if we left more or less immediately, before everyone else figured out a destination outside the devastation. I am thankful for all the local volunteers and those donating from afar to help those affected in real time by this disaster. When the dust settles .... Congress will authorize a $100Billion + spending bill to help Houston (read bailout everyone, home, business owners, insurance companies ). And Why not? It makes everyone feel good and it's just printed money (debt sold to central banks) - what some printed money compared to having families lose their homes. The debt will never be paid back anyway. There are increasing reports of looting happening now all over the Houston area, as well as reports that some looters appear to be arriving from elsewhere to take advantage of the situation. The takeaway here is that you had better be prepared for the human threats to closely follow the natural disaster. I know that’s not news to any of the loyal readers here, but it never hurts to reinforce the message. During the mayor's recent press conference (an hour ago) the Chief of Police spoke to this. There were also reports that the Cajun Navy (volunteers with boats) had been fired upon by looters (but also note they are running into increasingly desperate people rushing their boats). HOUSTON — A rescuer for the famed Louisiana Cajun Navy says looters tried to steal their boats and fired shots at them while they were trying to save Houston residents from flooded homes. Clyde Cain told CNN that a boat broke down, and while the crew sought shelter in a delivery truck, people tried to steal the inoperable boat. I was in Georgia during Hurricane Matthew. Once the water started to go down the looting began. The roads hadn't opened up yet and the only people around were the preppers who stayed and those who couldn't afford to leave. When there is no power and clouds overhead, it is very dark. Unbelievably dark. You better believe looting happens. You can try your hardest to dry out your possessions and defend your home, but there were thugs driving around during the day casing the neighborhoods to see who has generators and what houses are unoccupied. It is terrifying to sit at your window in complete darkness knowing there is someone outside trying to steal your possessions and wondering what is going to happen when you open the door to scare them away. What's truly astonishing is that the vast majority of people seemed to have no preparations in place. No extra food. No thoughts to even filling up a bathtub with extra water. No communications besides their cell phones, no plans of any sort, and no idea what to do. Reports are piling in of people faking 911 medical emergencies just to get an evacuation response. Apparently it hadn't occurred to them that there weren't 3 million emergency responders on call to respond instantly to their own unique and immediate needs. It's not just a snowflake generation, it's a snowflake country. Many lessons being taught here. Right on time...3-4 days into a crisis like this and people get hungry. Brazos at astonishing 59 feet! This community isn't even listed on the above table. Best to add it I guess. Here's a great comment about the Columbia Lakes levee breach. The place never should have been developed in the first place and wouldn't have been if private insurers were the only ones available. So homes were build right in a flood plain, an insufficient levee was placed around the development and the government now holds the bag on the mortgages. And by "government" I mean taxpayers. And by "taxpayers" I mean you and your loved ones. I have 62838 air miles from Alaska Air. (approximate) flight date/time(s) to make one or more flights happen. extra, but fairly big carry-ons are no additional charge for people. Can't fund bags. They can be paid for at airport ticket counter. I can help with a few of them with this. could execute on a "wish list". "Managed" might be a better fit. But this was what I was talking about in the outages section above. Long-term power outages are likely to cause all sorts of havoc on the recovery efforts. The disaster relief informal network is in full swing and I am sending some of my preps back to Houston. I can hear it now "Wow, someone sent us a water filter instead of bottled water! And with instructions too!" I have had (another) talk with my daughter about a backup power supply for their well, maybe it will get done this time. Anyway I would not have been prepared or able to give advice and direction without the likes of PP, Survivalblog, et al. Thanks to everyone, community rocks! There's a well-established physical law, the Clausius-Clapeyron equation, that says that a hotter atmosphere holds more moisture. For every extra degree Celsius in warming, the atmosphere can hold 7% more water. This tends to make rainfall events even more extreme when they occur. Another element that we can mention with some confidence is the temperature of the seas. "The waters of the Gulf of Mexico are about 1.5 degrees warmer above what they were from 1980-2010," Sir Brian Hoskins from the Grantham Institute for Climate Change told BBC Radio 4's Today programme. "That is very significant because it means the potential for a stronger storm is there, and the contribution of global warming to the warmer waters in the Gulf, it's almost inevitable that there was a contribution to that." I wonder where all the food warehouses are located? Most of the time industrial and warehousing is in the cheapest, i.e. most flood prone area of town. So, nothing is coming into the city, how long before the food is out for 4 million people? The plant, which produces explosive organic peroxides and ammonia, was hit by more than 40 inches of rain and has been heavily flooded, running without electricity since Sunday. The plant was closed since Friday but has had a skeleton staff of about a dozen in place. Following the flood surge, the plant's back-up generators also failed. According to the plant's website description, it "produces methyl mercaptan, ethyl mercaptan, dimethyl sulfide (DMS) and methylmercapto-proprionaldehyde (MMP)." By the time you see white caps on an interstate, what could possibly be left in life? Give this task to the army, not the average Joe. This is exactly what has been done in 1980 in El-Asnam (The city has been completely destroyed by an earthquake). The army was sent there to help, and every looter caught by them, was executed. Quick, cheap and most importantly very convincing. As I checked the recent news and especially the Twitter feeds the people of Houston are understandably thrilled that the rain has stopped and the sun is out. Already the headlines are about “healing from Harvey” but I should point out that this is premature. That has not even leveled off yet and seems to have some room yet to run. So inflows still exceed outflows. In a Tuesday afternoon press conference, the Army Corps of Engineers said that the pool elevation at Addicks had risen to 108 feet and is expected to peak at 110.4 feet. Barker is currently at 100 feet was expected to peak at 104 feet. God forbid a breach happens somehow because that would send a wall of water through Houston that would be above and beyond any damage seen so far. For now, officials are saying everything is fine, which is good news. Engineers will continue to raise the gates of dams slowly. Currently, the water in Addicks will flow at 3800 cubic feet per second and 3500 cubic feet per second for Barker. The goal is 4000 cubic feet per second is expected to be reached today. The water from Addicks is now flowing over the emergency spillway, [edit: I've since discovered, the spillways are not where the water is leavings from, it's an unplanned breach to the north] which is a very long concrete affair and seems unlikely to fail. Of course, this is exactly like the Oroville dam spillway and we are about to find out if it was designed and built properly. These spillways are probably designed to handle short-term events, with a defined amount of water flowing over. For example, because engineering costs money and things eventually get replaced anyways, the decision might have been made to design it for a 100 year event where the water topped out at 102 feet and a flow rate of X. Right now this is a 500 or a 1,000 year event and the water is going to top out at 110.4 feet with a flow rate of Y and then come down slowly over many days. I work for an agency but I can’t say which because I am not allowed to speak officially. Those spillways are meant to withstand short events. Water wins even when steel re-enforced concrete is concerned. I’ve seen some estimates the dam has about two hours and some say it could go as long as 12. It’s not particularly relevant because at this point the full flow of the tributaries is leaving so the downstream areas will be inundated. The only thing that may likely be prevented is a catastrophic failure that creates an instantaneous flood. Anyone downstream from there should be leaving no matter what. They are no longer safe. The 2-hour estimate was from a rather cynical engineer who doubts the spillway was maintained or even constructed properly because they are viewed as absolute last resorts that never happen. It’s taken 49 inches of rain to get to that point. The 12 hours was an engineer who was trying to factor in debris in the water and the destruction of the spillway itself below to top. Once the lower spillway is damaged it deteriorates quickly and moves back to the overflow top. He believes its likely within 12 hours that will occur because the water flow is neither steady nor has it had time to clear of debris. Water entering the reservoir contains a large amount of floating material because rain is still actively falling and levels are still rising. If this had been an upstream geographically removed from the damn, the amount of debris reaching and flowing in the spillway would be greatly reduced. This is an active event that is increasing in severity. He was also considering the fact that its likely at this time that the reservoir itself is filling with debris raising the bottom significantly. This lowers the ability of the reservoir to allow abrasive material to settle. The longer the rainfall occurs over the immediate area, the more abrasive and destructive the water will become. His estimate was that beginning at 12 hours the risk of failure is likely and it goes up steadily after that. He doesn't believe it will hold the 24 hours required for the localized rain to stop. So it seems that this situation needs to be monitored and that even though the sun is out and it’s stopped raining, it ain’t over yet. If the Addicks and/or Barton dams breach, Houston’s center will receive a very large blob of water that would be many feet on top of what’s already there. Perhaps 10 to 15 feet by some estimates. Yes, the sun is out and it has stopped raining. No, it isn't over yet but I understand that the attention span of the MSM and nation has already been breached. So we'll keep monitoring ourselves. I'm still reviewing a very complex and rapidly changing energy situation as a result of HArvey, but for now we can just look at gasoline futures and understand that a major situation is underway. I think it's entirely possible that actual shortages and rationing could result. This is especially true in the Northeast which is so heavily dependent on the Colonial pipeline. Buy gas, and consider storing some if you can. Remember, not int he garage. Keep your stored gas somewhere besides the structure in which you live. ...is that Oroville Dam narrowly missed becoming a major catastrophe. Now, that was a good thing for anyone living downriver of that dam, since they missed the devastation that would have wrought. However, I would assert that the media, and public in general, are taking the danger of failure of the two dams in Houston far too lightly. The interesting thing about a crisis averted is it reduces the chance of people responding with adequate attentiveness to similar crises in the future. It's as if the media I'm reading takes it on faith that these dams will hold. After all, Oroville held, right? I guess it's something like that. Perhaps it's a case of "well, New Orleans got toasted and the country just printed up money and carried on, so we will with Houston too." Only in business terms new Orleans is a national cost center and Houston is the production facility. There's no comparison between the two. There remains a very non-zero chance of dam failure in Texas here. That should be national news. My local paper has Harvey buried in the front section, on page 6. As a teacher who has taught in both independent and public education, I can assure you that part of the problem is that a good half of Americans probably couldn't tell you why there is no comparison between the two. Much less define "cost center" and "production facility." Same here. Let's just hope that those responsible for allowing people back into their neighborhoods understand that. I'll not put money on that hope, though. In looking over the past few posts I see that the Addicks reservoir is to peak at 110.4 ft and that the gates on the primary spillway are open which will reach a max flow today of 4,000 cubic feet per second. But, I don't see at what level the water will be going over the emergency spillway (shown in Chris's post #38 above.). Has the clock already started on the 2-24 hour time span given in the Reddit post or will the emergency spillway not be used because the 4,000 cfs will prevent it? Sometimes I miss the obvious so excuse me if that's the case. No, it's not over. Not by a long shot. This is happening because while Houston was getting all the press, Harvey landed again to the east this morning and dumped absolutely stunning amounts of rain on these smaller communities and cities like Beaumont and Port Arthur. Here's that exact address on Google maps, and then the street view during drier, happier times. That's really striking for some reason. Seeing all those dry houses absolutely flooded. Ugh. And finally here's Harvey making (his final) landfall this morning and showing exactly why these already swamped communities are now struggling with the additional 10 to 20 inches of rain they just got. It's been surprisingly difficult to get a solid answer to the question "what's the mean sea level height of the Addicks and Barkers spillways?" So far I'm stumped but I'll keep searching. And this is with another 2.4 feet of rise on the way....so there will be several feet of 'sheeting' over the breaches of these dams unless my math and physics are really bad. I say 'breaches' because apparently the water is *not* going over the auxiliary spillways, but over some other, lower points elsewhere. “These are not your typical dams; these are unique because of the type of terrain we have,” Long said, referring to Houston’s relatively flat plain. The Addicks and Barker reservoirs each have a main spillway and two auxiliary spillways. Water hadn’t breached any of those spillways, but instead was overflowing through a slightly lower point on the north end of the Addicks Reservoir. The largest crude oil refinery in the United States has shut down due to flooding from Tropical Storm Harvey. Motiva Enterprises' Port Arthur plant, which has been in operation more than 100 years, stopped operating Tuesday night. Motiva Enterprises has a crude capacity of over 600,000 barrels a day, supplying gasoline and diesel to thousands of retail outlets under the iconic Shell and 76- brands. Energy industry intelligence service Genscape said the refinery was using its safety flare system on Tuesday night. Flares can be a signal of the shutdown of a unit or units at a refinery. The flaring triggered messages on social media of a fire at the refinery, but Motiva confirmed there was no fire at the plant. A return to service is contingent upon recession of flood waters in the area. Well, truthfully, restarting will be contingent on a lot of things, namely the amount of damage done by water, the amount of damage done by the shutdown itself (apparently these are tricky things to shut down and then restart), and how long it takes to restore power. That's not too far from the poor woman's house seen a few comments above. If this plant is down for any extended period of time, there will be gasoline shortages resulting. It's not too early to begin thinking about operating under a regime of extended shortages...? This is what an out of control emergency looks and sounds like in the news. Good luck everyone living there, be safe and be smart (and please don't wait to be rescued if you are able to take care of yourself). JEFFERSON CO., Texas (FOX 26) - The National Weather Service has issued flash flood emergencies for parts of Southeast Texas, including Beaumont and Port Arthur. Mayor Derrick Freeman said on his Facebook page that the "city is underwater right now but we are coming!" He also urged residents to get to higher ground, but avoid becoming trapped in attics. Meanwhile, many residents evacuated to the Bob Bowers Civic Center. But by Wednesday morning, the Civic Center was flooding with hundreds inside and with nowhere to go. Port Arthur police later announced that the Carl Parker Center is accepting citizens seeking shelter, but there are no supplies at the facility. Residents and their loved ones in other areas continue to post to social media, out of desperation, the dire situation they're under. The Jefferson County Office of Emergency Management announced at 3:35 a.m. Wednesday that rescue efforts will resume at daylight. Deputy Marcus McLellan told FOX 26 the city's 911 system has been inundated with calls. This is very serious still. First, here's the most recent reservoir level as of 3:45 pm CDT. There was a seeming flattening and even a decline, and the a sudden jump and a flatline. So I am guessing their measurement device is dodgy or broken. At any rate, the last measurement value was 109 feet. 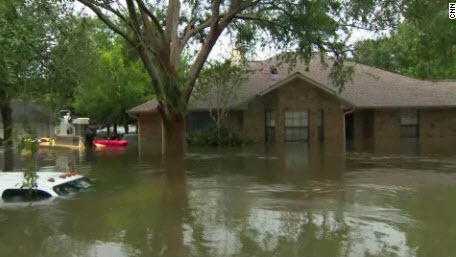 HOUSTON - Some 3,000 homes near Addicks reservoir and 1,000 homes near Barker are inundated due to water release, Harris County Flood Control District meteorologist Jeff Lindner said Wednesday morning. Uncontrolled releases are no longer expected around the Barker reservoir, the Harris County Flood Control District said Wednesday afternoon, but water releases will continue for days. Both reservoir outlet gates are open and releasing storm water into Buffalo Bayou, but pool levels may continue to rise. House flooding is occurring in adjacent neighborhoods, and roadways that run through the reservoirs are underwater. "The good news is we are getting very close to the peak at both reservoirs," Lindner said during a press conference. An area of the levee eroded on Wednesday morning, according to the Harris County Flood Control District. Officials said a breach is not likely, but possible. This occurred in the area where water is pumped out of the Cyprus Creek/Inverness Forest subdivision. A portion of the levee eroded after water came over the top of the intake system. Several agencies are trying to remedy the situation by bringing sand to the area. So a breach remains possible, but not likely, according to officials. Who would probably never say anything different even if they were scrambling like mad to avoid a breach. That, at least, is the learning from Oroville. Best not to trust official statements because those are geared more towards preventing panic (or official embarrassment) than providing useful data to the public. Maybe TX officials and associated Federal agencies are playing differently in TX than the CA/Oroville officials, but I wouldn't count on it. Arkema’s North America chief executive said on Wednesday the company has no way of preventing chemicals from catching fire or exploding at its heavily flooded plant in Crosby, Texas. 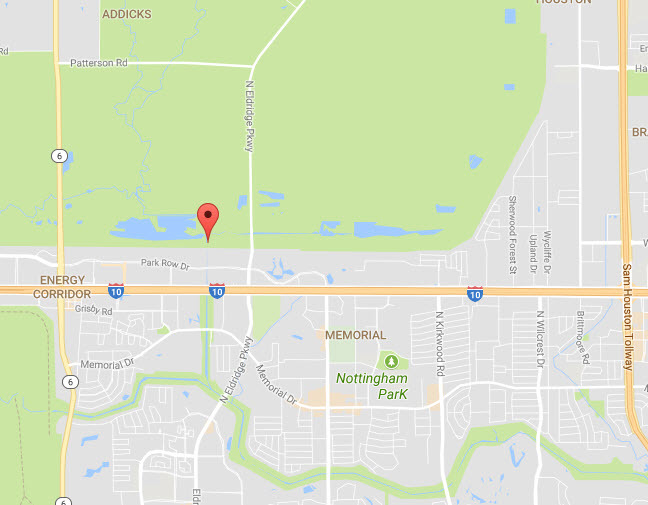 The company evacuated remaining workers on Tuesday and Harris County ordered the evacuation of residents in a 1.5-mile(2.4-km) radius of the plant that makes organic chemicals. Richard Rowe, who is chief executive of the company’s North America unit, told reporters the company expects chemicals on site to catch fire or explode within the next six days. He said the company has no way to prevent a fire or potential explosion near the plant that is swamped by about six feet (1.83 m) of water. Everyone should have a plan in place before a crisis hits. These are not things you want to have to return home for days later. Those are part of every prepared person's go bag routine.